The picture of Kramsky carries a deep meaning for the author. This canvas was written by him in connection with the loss of his two small children – sons. Grief and longing fill the picture from the inside – looking at it, tears involuntarily fill their eyes. 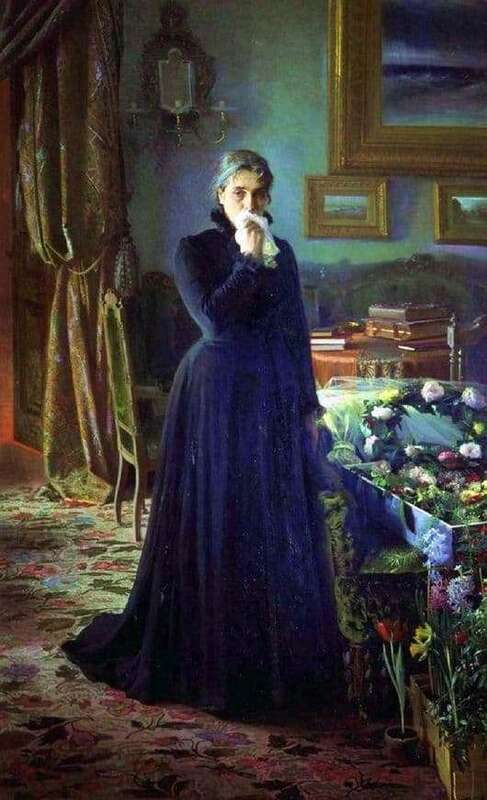 In the center of the composition is a woman in mourning dress. She is completely static – in the composition there is not a hint of the movement of her body. The woman is not young, her hair is already pretty touched with gray hair. In her hands she is crushed by a white lace scarf, which she brought to her face. The woman is calm. Her grief overwhelms. But this is not insane. She is calm, her grief is silent, but the pain holding her down is reflected in her gaze. The viewer, looking into the eyes of this character, will feel cold on his skin from pain and empathy for the suffering of this lady. She is inconsolable. Her whole appearance speaks of hopelessness, of the impossibility of finding a way out. She stands beside the coffin of her child – what more grief can a mother comprehend than see the death of her own child? The internal state of a woman is difficult to describe. The composition around it is also completely static. It seems that time has stopped in this room – the clock is not ticking, nor is the wind rustling. Everything is quiet and peaceful. The coffin of the child is visible only edge. But how ridiculous and grotesque amid this lull and immense grief is a bright floral wreath prepared for the deceased. He crowns the coffin of the deceased and would be better suited for the festivities at the feast than for the memorial ceremony. But bright luxurious flowers are crowned, alas, not the head of the bride. In the foreground in the right corner we can see a lonely red flower in a pot. He stretches to the light, to life. Only this flower is a symbol of faith in a better future, a symbol of hope for the continuation of life. He gives faith that the pain will subside and something good will return to this house and fill it with happiness.